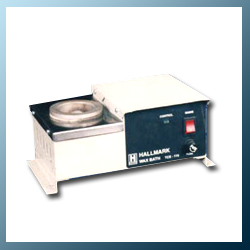 DIgital Temperature Controlled Wax Baths, Manufacturer, Supplier, Pune. We are Manufacturer, Supplier, Exporter of Digital Temperature Controlled Wax Baths, Analog Temperature Controlled Wax Baths, Temperature controlled Solder Bath. We present high tech temperature controlled wax baths which are used for sealing various components. This device offers an additional feature by providing the facility to set the temperature as required. The size of our temperature controlled wax bath is 40 mm x 40 mm.